With Apple’s recent announcement of the iPad 2, the Cupertino-based company has emphasized the importance of its A5 chip in differentiating the tablet from its predecessor. Created in a collaborative agreement with Samsung, the A5 chip is a proprietary dual-core processor that will likely find its way into a slew of Apple devices. What are the advantages of multi-core processors? More importantly, how was Apple able to accomplish this amazing technical feat? In order to fully understand the many benefits of inserting a dual-core processor in a mobile device, one must first grasp what a dual-core processor actually is. Functionally, it is the processor’s job to read and execute instructions, such as sending data to your display or allocating memory to various tasks. A multi-core processor has a certain number of processors that can perform these tasks, commonly referred to as cores. Therefore, a dual-core chip is one that has two individual processing units, which allows for multiprocessing, message passing, or inter-core communication, ultimately resulting in a faster experience. Interestingly enough, having a billion cores would result in less efficient computing, as many-core processing results in instruction congestion and data confusion. But do not worry, the many-core threshold requires around 32 cores of computing power, which one should not expect until the iPad 32. 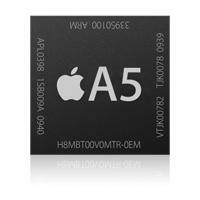 The predecessor to the A5 chip, the A4, was quite powerful in its day, housed in the first-generation iPad, iPhone 4, and second-generation Apple TV. The A4 chip is a package-on-package system-on-a-chip, meaning that it can contain digital, analog, mixed-signal, and radio frequency functions on a single chip. Essentially, the consumer electronics manufacturer employed the use of an integrated circuit packaging technique allowing for the combination of discrete logic and memory packages. Based on the ARM processor architecture, it ran at 1 GHz with an integrated graphics processor. Set to commercially debut on March 11th with the iPad 2, the A5 processor is said to be twice as powerful with the GPU (Graphical Processing Unit) being up to nine times as efficient. This is accomplished through the addition of a second processing core. The superior graphical capabilities will translate into better performance during video-viewing as well as gaming, while the additional core will result in faster app loading and switching. What can be somewhat puzzling, however, is how Apple managed to accomplish this without losing any battery life and making the device even thinner. Though there is still some ambiguity and one can only speculate at this point, it can be assumed that advancements in battery technology and the efficient allocation of processing power would result in ten hours of battery life. Many critics are beginning to ask if the processor will remain relevant throughout the iPad 2’s product cycle, considering the fact that NVIDIA has a quad-core processor on the horizon and many Android-powered handsets are now running on dual-core chips. However, with the low footprint of iOS and lack of memory hogs like widgets and live backgrounds, the A5 chip will likely compete with the best of them for some time. Apple’s latest innovation will likely find its way into the next generation of the iPhone, and hopefully a refreshed operating system will take advantage of the greater processing speed. But one can only dream. What do you, fellow admirers of hardware, think of the implementation of a dual-core chip? Will Apple be able to keep up with the competition? Will it be significantly better than its predecessor? Sound off in the comments below.